As soon as you fire up the game you're greeted with a visually very pleasing welcome screen that demonstrates a great example of the unique graphical style we have come to expect from the Art Style series. On the stage selection screen something resembling Morse code is “played” in the background, and although this doesn’t seem to serve any deeper purpose it gives the game a very quirky if not slightly unnerving feeling. It’s these small touches that give the Art Style series an edge of originality and quality not seen in many puzzle games. As always an instruction manual is available in order to get acquainted with the game’s controls and objectives. Although this is arguably a tad superfluous as the game has simple controls and an even simpler goal. Nevertheless a tutorial is also available which demonstrates the game in action. 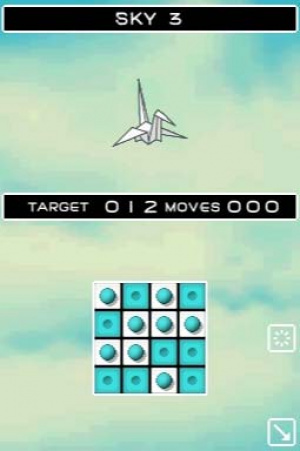 Nintendo describes the game as a “relaxing logic puzzle where the objective is to match coloured panels with spheres of the same colour”. In the early levels the challenge is minimal as the player is tasked with matching up spheres and tiles of only one colour, creating a gentle introduction to the mechanics of NEMREM. This gentle pace does not last however as multiple colours are quickly introduced, creating a somewhat more intellectually taxing experience and indeed the limited number of “allowed moves” can make some levels pretty difficult! Furthermore the game later introduces “locked panels” which limit the way in which the player can move panels. Each game world contains nine puzzles, each of course with increasing difficulty. The game is played using only the stylus and it’s pretty much as simple as it sounds: tiles are slid in order to match coloured panels up to the corresponding coloured spheres. The Art Style series has been praised for its high quality sound effects and music and NEMREM continues this level of quality with some pretty chilled background tracks which go perfectly with the laidback nature of the game. One of the main problems with certain puzzle games is that a long puzzle will often become quite infuriating with its music being looped over and over. The music in NEMREM is far from complicated in its melodic arrangement, yet at the same time it's entirely pleasant to listen to, so you needn’t worry about having to turn the sound down in order to finish a particularly strenuous puzzle. To surmise the sound in NEMREM is pretty much awesome and complements the game perfectly. 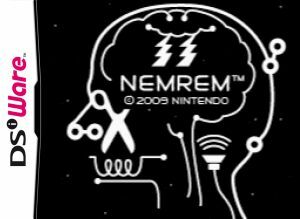 Overall NEMREM is an excellent addition to the Art Style series as well as a welcome addition to the DSiWare service. The game features simple, intuitive gameplay and clean, “to the point” graphics. The sound and music in the game is perfect and the game mechanics are simple enough to offer quick sessions of play, and are addictive enough that you could be hooked for hours. Some sort of multiplayer mode would have been a nice addition although this is perhaps not entirely necessary or even suitable for the type of game NEMREM is, namely a strong solo puzzler. It's fair to say that NEMREM has a great deal of replayability as completing certain puzzles under the assigned restrictions can be pretty challenging, especially in later puzzles. 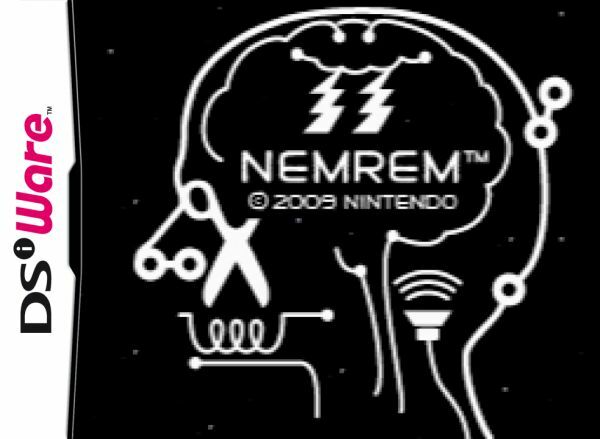 For the 500 Nintendo points asking price NEMREM is most definitely a bargain and a must for any fan of the puzzle genre. Wait, did the conclusion say 800 points!? I thought it was 500. Also very happy that this game was well recieved by nintendo life! Yeah, I thought all of these Art Style games are 500 points. 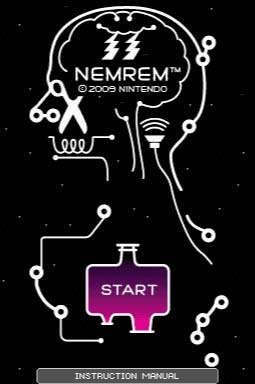 I like Nemrem since I found a game where I have to think to solve the puzzles while not having to remain at a high adrenaline level pretty useful for relaxing. Quite a few of the music tracks are plain unpleasant though, e.g. the second one has long bleeps that are about as pleasant as microphone feedback. I'd probably get a DSi just for the Art Style series... if Nintendo of America weren't for some reason releasing them less frequently than the other regions. Good revw and thanks for the hard work on the speedy revw (unlike the slapdash ign revws). At this time i'd give it a 7, but I've haven't played it enough to really give it a score as such. I love this game, it's just like a 2D rubiks cube puzzler! The review didn't really do it justice, though. I would prefer it if the game had some extra features though, rather than just the standard mode, however addictive it may be. this is an art style game I'll pass on. It's a great game, as is every Art Style. I agree with the score. I dunno if we will get this game since we never got D-CODE yet, been waitin on that for awhile and hopefully we'll get that soon plus with this game too as well. I doubt it, prolly aint gonna happen anyways.. just my thought. Before NOMNOM I was using Code for my DSiWare quiet puzzle needs since it has a puzzle mode too, also with a goal move score (but AFAIK Code's goals were the minimum number of turns you could use to solve it, NOMNOM gives you some leeway with the target being a good bit over the minimum number). VERY concise review. I think that's plain for everyone to see. To be fair, the game doesn't require much explaination or a lengthy review imho. I've played this further and have to say, while its a worthy download, its the "worst" art style game so far. BUT that doesn't mean it isn't good as the art style series is a high standard one. It is me, or is this game very difficult? Holy hot damn is this game addictive! I had a feeling I'd love it but I was put off for a while due to mixed impressions. Needless to say, it's one of the best DSiWare games I've downloaded. If you're a puzzler fan, give it a go, chances are you'll get sucked into its colour matching charms the same way I have! It just looks painful for me - it's a pass. This is really awesome and pretty hard . I got to the falls, but I haven't played it for months, I will start again ^^! Just searching to download this on my DSI and I can't find it. Is it no longer available? @dirty.martini Hmm... I haven't noticed that, but I don't think so. Go to the 500 points category and then search by genre-puzzle if you don't find it there... Maybe a server glitch lol. This game is really difficult, but it is good.